Name tags identify the owner of school items like clothes, shoes, and lunch boxes. Schools naturally generate the potential for a LOT of lost property. Hundreds of children cart around similar, if not identical, possessions in busy shared spaces, rushing from room to room, space to space, taking little time to really check if the stuff they’ve picked up is actually their own. With Stikins name tags, kids have a quick and simple way to know that they’ve got their own stuff. If (when) stuff goes missing, name tags make it incredibly easy for lost items to be returned or retrieved from the lost property box – ensuring that belongings don’t end up abandoned just because there’s a teeny tiny chance that they might belong to somebody else. Stikins are tough and durable so they can survive not only repeat trips through the washing machine and tumble dryer, but also the rough and tumble of school life, term after term. How Do Name Tags Stop Stuff Going Missing? Name tags instantly answer the question “whose is this?”, so items can be returned before they reach the lost property box. A good name tag puts an end to the trauma and drama of lost property – from tearful, guilty admissions to disappointed parents to the trip to the school office to rummage through salvaged items with dubious origins and (often) stains. How Do Name Tags Help Teachers? Teachers have a LOT on their plate and wasting time on lost property is especially frustrating because it’s an unnecessary problem that’s easily avoided. 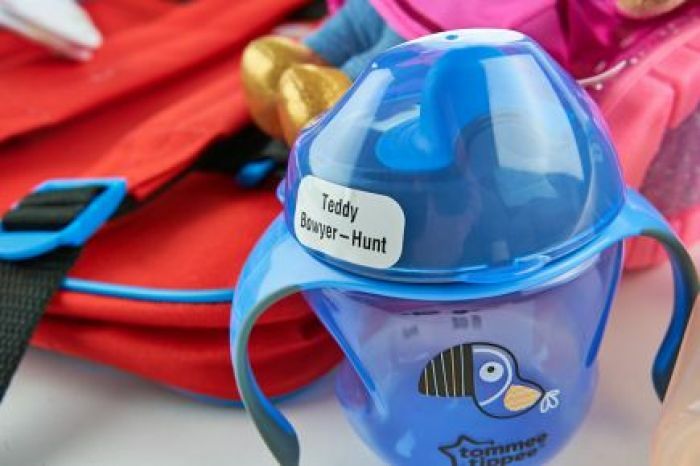 Name tags make it easier for children to keep hold of their stuff, quicker to return lost items, and encourage pupils to take responsibility for their own belongings. Can I Use Name Tags To Label Clothes? Yes! Stikins name tags were developed specifically for clothing. Stikins stick onto wash-care labels; as virtually all garments have a wash-care label, this means Stikins provide a brilliant labelling solution for almost all kids’ clothing! Can I Use Name Tags To Label Shoes? Yes! Labelling shoes is a great idea. Clothes are easily mixed up but shoes like to pile on the pressure with their tendency to wander off by themselves AND by being part of a set – instantly doubling the chances of getting lost. Things only get worse in schools, which are full of chaotic classrooms, cloakrooms, and changing rooms where children frantically kick off one pair of shoes in exchange for another – shoes that, in all likelihood, are almost identical to everyone else’s. Are Stick On Name Tags Better Than Sew-In Name Tapes And Iron-On Name Tags? We certainly think so! And so do our customers. Sew-in name tapes have long been a staple of the school experience but there is no escaping the fact that they take AGES to sew in – and that’s if you happen to be a dab hand with a needle and thread. 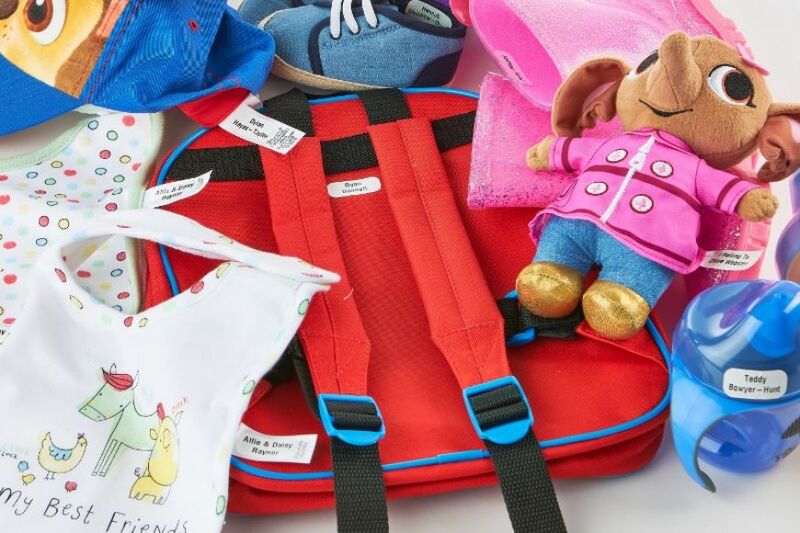 For many parents, even the thought of sewing in labels is an absolute nightmare. Iron-on name tags are supposedly easier BUT still take a great deal of time and care (not to mention a burning hot iron) to apply – and often produce mixed results. Stick on name tags are so much simpler. You peel them off the backing sheet and stick them down. No needles. No irons. No sewing. No ironing. No problem. What’s more, sew-in and iron-on labels can only label clothes and fabric items. Stikins can label pretty much everything and anything, including lunch boxes, water bottles, sport equipment, stationery, and all those other “essentials” kids won’t do without. When Were Stikins Name Tags Created? Stikins name tags were created in 2003. 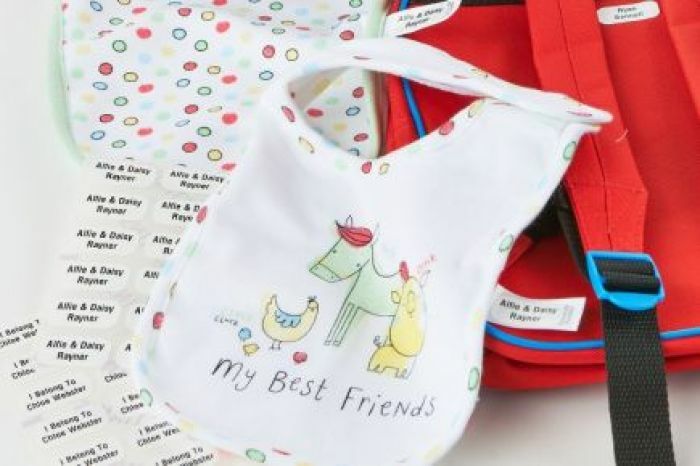 Our managing director felt that sew-in and iron-on tags simply weren’t up to the task of labelling his four children’s belongings and decided to use his background in self-adhesive labels to find a better solution. 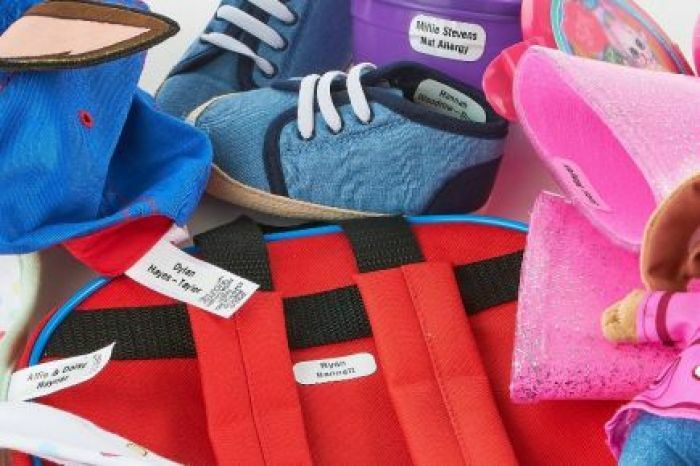 Our “Original” Stikins launched way back in 2004, as a set of sticky name labels including H-shaped clothing labels, shoe labels, and micro labels. Over the years, we’ve continued to research and test new materials and manufacturing methods to introduce new and improved versions of Stikins – so we can continue to ensure that our name tags offer a unique labelling solution that really does just stick on and stay on. What Size Are Stikins Name Tags? Stikins name tags are 30mm x 15mm. We use this one size because it fits neatly and discretely onto items of all shapes and sizes – including wash-care labels in clothing. Our name tags are large enough to read at a glance but don’t take up too much space or draw too much attention. What Colour Are Stikins Name Tags? We want Stikins to be as efficient as possible; combining a brilliant white background with bold black print makes our name tags brilliantly easy to read. How Big Will The Letters On My Name Tags Be Printed? The font size depends on how many characters you request. Our name tags come in one size only so our system automatically reduces the font size until all of your characters fit onto your name tags. Our website features a print preview so you can get an idea of what your name tags will look like. What Do Other Parents Think Of Stikins Name Tags? We have received thousands of brilliant reviews from customers who have been using Stikins name tags for years. We ask all of our customers for feedback and we use all of our reviews to find out what we’re doing well and what we could improve to make our products and services as useful as possible to our customers. How Soon Will My Name Tags Arrive? We offer super quick despatch and delivery of name tags. All orders are sent out by Royal Mail’s first class service and around 93% arrive next day. We also offer a Special Delivery option for £6.30, which guarantees next day delivery. We print name labels every day, Monday to Friday, up to 3pm, to ensure that every order of Stikins goes out same or next working day – all year round, even during the back to school season. How Much Do Name Tags Cost? Stikins name tags are available in four pack sizes. Buy 30 name tags for £6.80, 60 name tags for £9.50, 90 name tags for £12.00, and 120 name tags for £14.20. Stikins name tags for kids stick to almost anything – including school uniform, books, toys, lunch boxes, and all their favourite stuff! Name tags for kids that simply stick on and stay on – with no sewing and no ironing required! Stikins have been independently tested for 60 washes at 40 degrees, making them the most reliable name tags for kids available! White name tags printed with a bold black font that is clear and easy for children to read. Our unique adhesive keeps your items safely and securely labelled all year round. 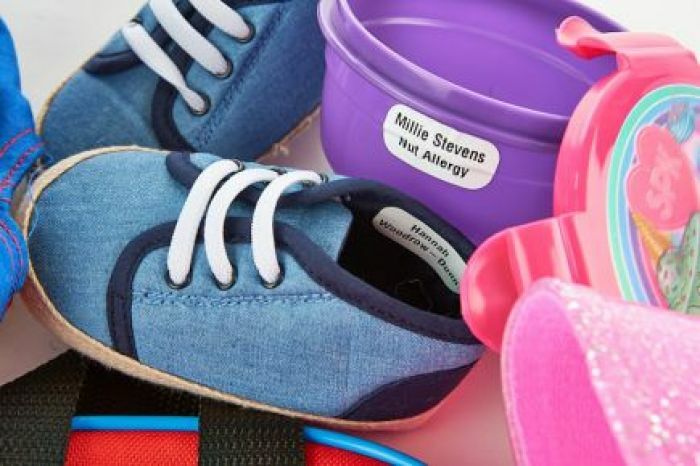 Label all your children’s belongings with one pack of stick on name tags. Stikins are multipurpose name tags that simply stick in and stay in - no sewing or ironing required. Label all of your children's belongings safely and securely in minutes! 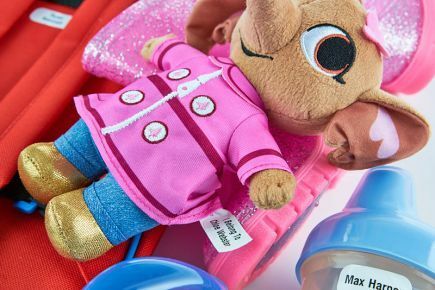 Find out more by reading these reviews and blog posts about using Stikins to label all your children's belongings. A friend got me a very small pack as she found them in her words "the most useful tags out there".I was dubious as they didn't appear any different to all the others I'd had and kept using but hey I got them for free! They have lasted longer than any others I've known! None came off in the wash or went grey! I don't know why and I can get them off when I pass the clothes on so either they are magic or there's a secret all mums should know! Best name tags, not cheap but I can guarantee worth it. Fantastic, quick delivery. Excellent quality name tags that you can put on anything. Sticky Name Tags That Are So Easy To Use, You’ll Be Over The Moon! I love these stickers they are just perfect for school uniforms and toys and water bottles. They don’t come off in the wash or dishwasher and work much better than laundry pens. Order more than you think you need. I stick them on everything and they are so much easier than sewing on labels. Great product. Stikins Name Labels Presents – OUR BRAND NEW WEBSITE! Happy #TartanDay From Stikins Name Tags! It’s #GoodFriday Which Means That The Easter Bunny Is On The Way! #HappyEaster From Stikins Name Tags! Wishing you all a Happy New Year from the Stikins ® Team! We’re Going Dippy For Delightful Names Given To Dazzling Discoveries! Always a very fast service and the labels are great. They are very sticky and they don't come off in the wash. We use them on clothes, shoes, water bottles, food containers, toys etc.